Synopsis: Even though he’s from a wealthy family, teenager Bill Whitney just can’t seem to fit in among the mysterious upper class of Beverly Hills. But when he learns that his parents and sister may be involved in a secret society, Bill begins to realize that rich people are indeed very different from the rest of us. 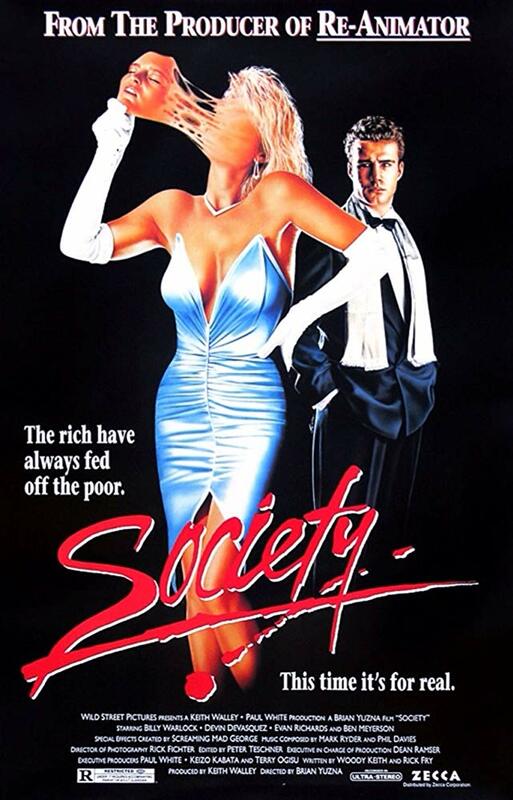 Review: Made in 1989 but released in 1992, Society is one of those cult classics that I’ve heard a lot about over the years but it never wound up coming home from the video store with me. I clearly remember the VHS cover (the same as the poster above) and always felt like it was one I should consider but something kept me at a distance. I mean, why check out this one when Full Moon Pictures just released another Demonic Toys movie, right? Well, recently I was plumbing the depths of Amazon Prime looking for deep dive horror titles for 2018’s 31 Days to Scare and lo and behold there was Society just waiting to be added to my queue. I was in such a jolly mood that day I promptly started the thing and 99 minutes later I’m not exactly sure I liked what I saw but I’m glad I finally saw it. Here’s a decently made film with curiously off-kilter performances that work almost in spite of themselves and a total whack-a-doo plot involving a secret society that has developed a fetishistic need to feed. Beverly Hills teenager Bill Whitney (Billy Warlock, who I remember from Baywatch but was also in Halloween II) is struggling with feeling out of place among his parents (Charles Lucia and Concetta D’Agnese) and sister (Patrice Jennings). Though he’s got a good friend in Milo (Evan Richards, Altered States) and a willing but willful girlfriend (Heidi Kozak) he can’t help but recognize he’s also been ostracized at school by an elite clique he can’t break into. Things get weird when an ex-boyfriend of his sister shows up with evidence that her recent coming-out party was actually an initiation ceremony for something…odd. Rick Fry and Woody Keith’s screenplay takes a while to get going and suffers from repetition almost from the get-go. In scene after scene we see Bill wonder aloud if something weird is going on right at the same time everyone can tell that something weird is definitely going on. That it takes him so long to put the pieces together and for the film to catch up with the audience gets exasperating and by the time we’ve reached the big reveal in the third act any potential shock would be worth our effort but director Brian Yuzna really rewards gore hounds for their time. It’s a stomach churning bit of gore well executed by Screaming Mad George (credited as the Surrealistic Makeup Designer and Creator) and you’re advised to skip any greasy snacks you may have gathered for your viewing party. The finale is gross, no question, but also a clever twist on the way similar plotted paranoid thrillers have reached their dénouement. Even with a low budget the technical aspects are strong. While the script saddles Warlock with a few doozy lines (watching a bloody body covered with a sheet being loaded into an ambulance Warlock’s character asks with honest sincerity “Is he dead?”) he makes for a satisfactory lead. You can tell why he wound up on a daytime soap after leaving Baywatch. The rest of the cast have their moments but there isn’t anyone that attempts to rise too far above the B-movie material. While it could have easily been 10 minutes shorter, Society is a nice find on Amazon’s streaming service and worth seeking out if you have the stomach for the gore of the finale and the patience to wade through some plot contrivances on your way there.